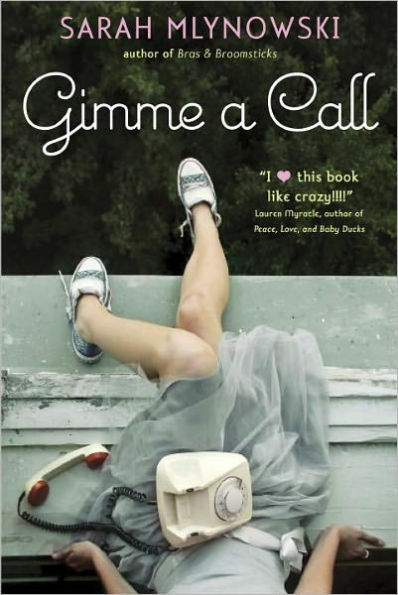 So reads the back-cover blurb of Sarah Mlynowski’s adolescent chick lit novel, “Gimme a Call.” (Of course, I object to the “chick lit” label on principle, but that is another tangent for another time, and it is, factually, how the novel is classified.) The premise of “Gimme a Call” is that Devi, our 18-year-old narrator on the cusp of graduating high school, somehow (via unexplained but useful plot devices) magically calls her 14-year-old self on her screwed-up cell. Devi, loathing her forthcoming future of a community college, parents with a messy marriage and a no-longer boyfriend, instantly intervenes in her younger self’s life. The repercussions of what snowballs into a series of calls result in Old Devi’s reality altering around her every time Young Devi changes any choice. Devi in particular frays my willing suspension of disbelief; she’s selfish, lazy, judgmental and careless. I don’t like Devi as a character, but I’m also unable to judge her too harshly considering (1) she’s a fictional character, and (2) the fundamental foundation of her character is that she regrets the choices that have led her to where she is. At the climax, Devi and her younger self are no longer able to communicate, and the changes wrought up until that point become set in stone. While I dislike that Old Devi ends the novel at NYU with a mended home life without truly working for any of it, she still undergoes some of the most radical character growth of countless chick lit characters: She admits fault, and she learns. The function of employing her as our protagonist illustrates to us, the audience, what it means to make all the wrong choices, especially when those of us reading have ostensibly made all the right ones. This particularly strikes a chord with Older Me in college, a chord that I’m not certain my younger self fully comprehended. As college students – and especially as Stanford students – much of our youth was devoted to looking forward, to planning ahead, to arriving where we are and, in doing so, making all those smart choices that Old Devi didn’t the first time around. A lot of us are still unhappy, though, even though the story’s happy ending says we shouldn’t be. On that side of the spectrum, though, is being so paralyzed by possibility that we miss the opportunity to do anything at all. Nineteenth-century author Henry James (ha! I bet you thought that was just a name drop earlier!) wrote the novella “The Beast in the Jungle,” in which a man with the theory that his life will somehow be tragic realizes that it is precisely so because he didn’t live it, instead living in infinite wait for something to happen to him. (That story messed me up.) So if I don’t want to be like James’ protagonist, or like Devi, what do I do when I imagine choices I might have made in circumstances I’ve never encountered, and the uncertainty of those unlived days and those lives with which I’ll never see what I could do? Why does all that potential frighten me as much as it does? Because it’s out of my power? Or because it actually might not be, if I made the right (or wrong) series of choices? So, I’ve been thinking a lot about choices. The narrative that dominates media – and not just Devi’s story or Disney schticks – is one of “listening to your heart” or “being true to yourself.” This suggests that the self is something inherent, immutable, immortal, crusted over with social conventions and the lies we tell ourselves, but, as “Gimme a Call” points out, the self is composed of choices – even inconsequential ones that pile up. We anticipate that we will “find ourselves” as if we grow by trying new things, new people, new places, all in the hope that one will resonate with us in some wordless way and narratively confirm the choices we made. That mentality is both tantalizing and terrifying. Using the excuse of what “feels right” has always felt lazy and self-defeatist to me, as it cancels out choices that I can’t even know about, but I still fall back on it to justify everything from self-care to retroactive self-reassurance. Of course, a political philosophy professor I had my freshman year would argue that some choices just aren’t available to us because of the attached consequences; therefore, there must be a balance between limitless choice and feeling free from those choices’ external frames. I think where most people – myself included – go wrong is assuming choices can’t change; I can change my mind about my career years down the road, and both that and my previous choice are valid expressions of the self, no matter the duration. My insecurities are products of thinking I’m making the wrong decisions while everyone else instinctively has the right roadmap. Trusting myself to make those choices that, in turn, make me is a feedback loop, but one that is ultimately up to me to stop, start and spin around at will – but it’s a little more complicated than a phone call.